The trade skirmish between the US and China on steel, aluminium, and other goods is a product of US President Donald Trump’s scorn for multilateral trade arrangements and the World Trade Organisation, an institution that was created to adjudicate trade disputes. Before announcing import tariffs on more than 1,300 types of Chinese-made goods worth around $60 billion per year, in early March Trump unveiled sweeping tariffs of 25 per cent on steel and 10 per cent on aluminium, which he justified on the basis of national security. 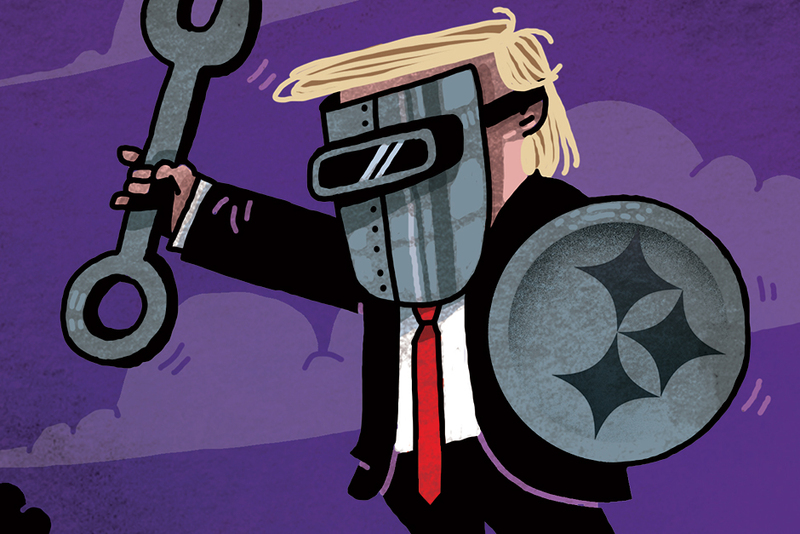 Trump insists that a tariff on a small fraction of imported steel — the price of which is set globally — will suffice to address a genuine strategic threat. But there are a host of issues in contention, involving, for example, lumber, milk, and cars. Is Trump really suggesting that the US would sacrifice national security for a better agreement on these minor irritants in US-Canadian trade? Or perhaps the national-security claim is fundamentally bogus, as Trump’s secretary of defence has suggested, and Trump, as muddled as he is on most issues, realises this. As is often the case, Trump seems to be fixated on a bygone problem. Recall that, by the time Trump began talking about his border wall, immigration from Mexico had already dwindled to near zero. And by the time he started complaining about China depressing its currency’s exchange rate, the Chinese government was in fact propping up the renminbi. Likewise, Trump is introducing his steel tariffs after the price of steel has already increased by about 130 per cent from its trough, owing partly to China’s own efforts to reduce its excess capacity. But Trump is not just addressing a non-issue. He is also inflaming passions and taxing US relationships with key allies. Worst of all, his actions are motivated by pure politics. He is eager to seem strong and confrontational in the eyes of his electoral base. Even if Trump had no economists advising him, he would have to realise that what matters is the multilateral trade deficit, not bilateral trade deficits with any one country. Reducing imports from China will not create jobs in the US. Rather, it will increase prices for ordinary Americans and create jobs in Bangladesh, Vietnam, or any other country that steps in to replace the imports that previously came from China. In the few instances where manufacturing does return to the US, it will probably not create jobs in the old Rust Belt. Instead, the goods are likely to be produced by robots, which are as likely to be located in high-tech centers as elsewhere. Trump wants China to reduce its bilateral trade surplus with the US by $100 billion, which it could do by buying $100 billion worth of US oil or gas. But whether China were to reduce its purchases from elsewhere or simply sell the US oil or gas on to other places, there would be little if any effect on the US or global economy. China’s response has been firm and measured, aimed at avoiding both escalation and appeasement, which, when dealing with an unhinged bully, only encourages more aggression. One hopes that US courts or congressional Republicans will rein in Trump. But, then again, the Republican Party, standing in solidarity with Trump, seems suddenly to have forgotten its long-standing commitment to free trade, much like a few months ago, when it forgot its long-standing commitment to fiscal prudence. As Chinese firms have become more competitive, wages and environmental standards in China have risen. Meanwhile, China has been slow to open up its financial markets, much to the displeasure of Wall Street investors. Ironically, while Trump claims to be looking out for US industrial workers, the real winner from “successful” negotiations — which would spur China to open its markets further to insurance and other financial activities — is likely to be Wall Street. Today’s trade conflict reveals the extent to which America has lost its dominant global position. When a poor, developing China started increasing its trade with the West a quarter-century ago, few imagined that it would now be the world’s industrial giant. China has already surpassed the US in manufacturing output, savings, trade, and even GDP when measured in terms of purchasing power parity. The EU, for its part, seems highly concerned with protecting data privacy, whereas China does not. Unfortunately, that could give China a large advantage in developing AI. And advantages in AI will extend well beyond the technology sector, potentially to almost every sector of the economy. Clearly, there needs to be a global agreement to set standards for developing and deploying AI and related technologies. Europeans should not have to compromise their genuinely held concerns about privacy just to promote trade, which is simply a means (sometimes) to achieving higher living standards. In the years ahead, we are going to have to figure out how to create a “fair” global trading regime among countries with fundamentally different economic systems, histories, cultures, and societal preferences. The danger of the Trump era is that while the world watches the US president’s Twitter feed and tries not to be pushed off one cliff or another, such real and difficult challenges are going unaddressed. The writer is the winner of the 2001 Nobel Memorial Prize in Economic Sciences.